This experience is for the Gamer wanting to try some of the firearms seen in the great shoot-em-up games such as COD or Battlefield. This option is about trying some of the different styles of firearm used in the games and seen in some more modern films and TV series such as "Heat" and "Walking Dead"! Here is an overview of some of the rifles that may be available when attending this experience. Please Note: All our firearms are semi-auto or single shot, reduced calibre versions of the original firearm to comply with UK law. This iconic sub machine gun was initially developed in the late '40s and entered service with the Israeli Defence Force in the mid '50s. Since then it has been used as the personal defence weapon for officers, artillery and tank crews due to it's handy small size. The Uzi was the favourite of Arnie in "Terminator" and Jamie-Lee Curtis in "True Lies" and is a very recognisable profile. Our version has a folding stock and large sound suppressor on the barrel. 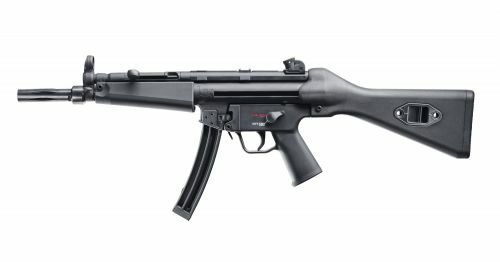 One of the most popular sub machine guns, the MP5 has been the mainstay of security, defence and special forces the World over. Small and compact and with many different variations and configurations make this a very versatile design. This along with proven reliability has ensured its continuing popularity with the special forces around the World, it was famously seen live in action on the TV in the breaking of the Iranian Embassy siege by the SAS back in 1980. Developed initially for the use by SF and security forces of the Czech military, the Škorpion was also issued to vehicle operators and crews and as a personal side arm to officers and NCOs in several armies around the globe. Designed in the late 50's the Škorpion, firing a small light recoil bullet, has also seen use by several terrorist organisations, notably the IRA and Red Brigade and used in terror attacks in France. In films the Vz61 has been seen in "Body of Lies", dual-wielded by Neo in "The Matrix", in "Ronin" and by the Winter Soldier in "Captain America". Developed in the late 1950's the AR15 series of rifles has gone through several improvements over the years. 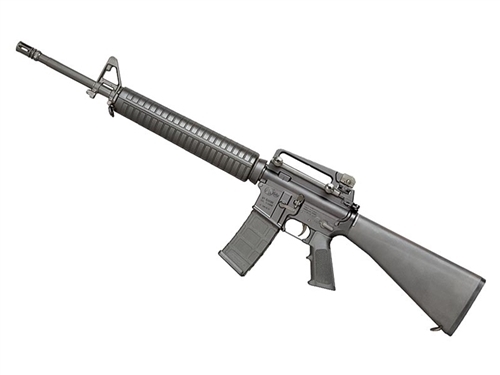 Adopted by the US military as the M16, versions can have full-auto or burst fire capability. Building on lessons learnt in the field the M16 has improved to become one of the most versatile and reliable rifles in use today. Our AR15s come both scoped and with the A2 iron sights and semi-auto only. 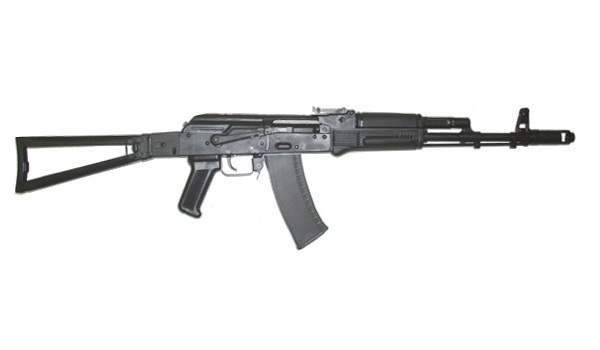 The 'Kalashnikov', the AK47 is the assault rifle of the Warsaw Pact and general bad-guys in the movies. Developed just after the Second World War by Mikhail Kalashnikov the AK became the standard firearm of the Soviet Block countries and to some extent the AK47 and its variants remain the most popular and widely used assault rifles in the world. The AK47 has seen many incarnations over the years and is a very versatile 'assault rifle', inspiring design and versions from pistols to light machine gun. Renowned for its reliability and ease of use and manufacture, especially when compared to other more expensive western firearms in its class, it is employed all over the World. With its distinctive curved magazine it is easily recognised by movie goers and gamers alike. 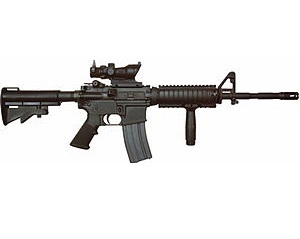 The Colt M4 is a carbine or shorter version of the M16. 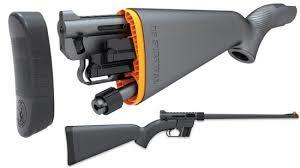 It sports a collapsing stock and shorter barrel and is a lot lighter as a result. The shorter barrel doesn't give up much in the way of performance to the longer barrelled versions at common engagement distances and is a lot easier to carry around and manoeuvre in and out of vehicles and buildings. 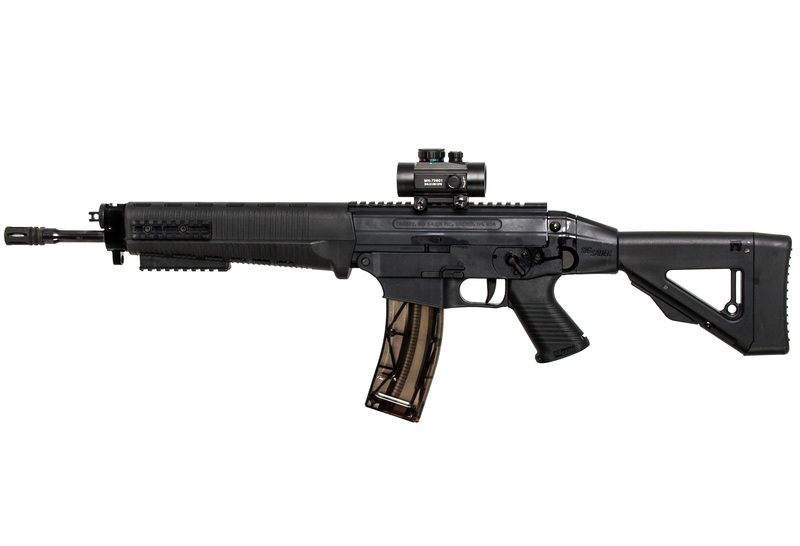 Developed by FN Herstal in response to the US Special Operations Command (US SOCOM) request for a SOF Combat Assault Rifle (hence SCAR) in the early 2000's. The specification was for a new combat rifle that was specially tailored to the future needs of Special Forces. Making extensive use of polymers to lighten the weight but maintain strength FN's SCAR won the bid and the FN SCAR/L (designated "Rifle Mark 16" by the US Navy) has entered service not only with SF forces but Belgian Military as well. 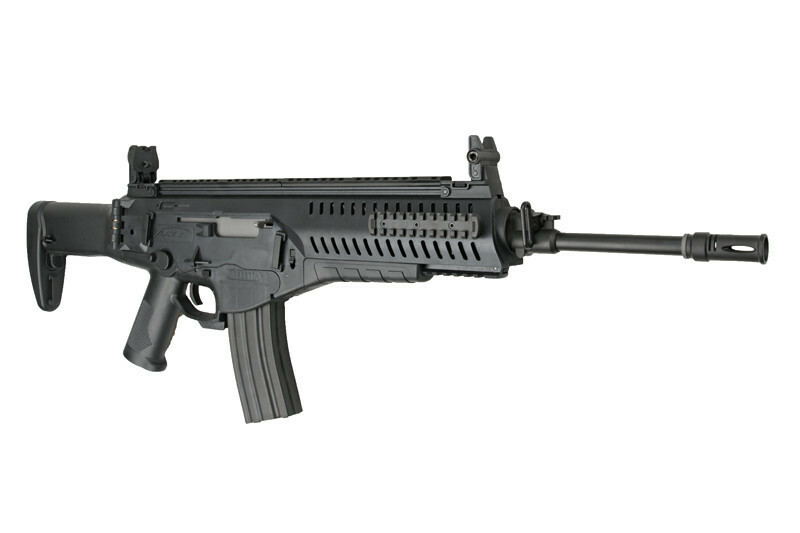 Beretta designed the ARX160 as part of the "Future Soldier" project in the late 2000's. The design followed the modern trend to make greater use of composite materials the ARX has seen action in Afghanistan and is being issued to all branches of the Italian Military. An intriguing design it has ambidextrous controls like most modern firearms and also the ability to eject the spent cases out either side. It has been looked at as a replacement for general issue by the US, French and Indian Army among others and has been in use with Albanian Armed Forces. Based on the SIG SAUER 550 series of rifles this design dates from the early to mid '80s and replaced the StGw57 of the Swiss Army in 1990 (designated the StGw90) and has been adopted by governments all over the World. A lightweight modular design allowing for full length general combat rifles to short carbines for use by crews, officers and SF, the SG550 range has proved popular with troops, sportsmen and hunters alike. The SG522, as a faithful copy of the SG551, is a sub calibre training version. The G36 was developed for the German Military. 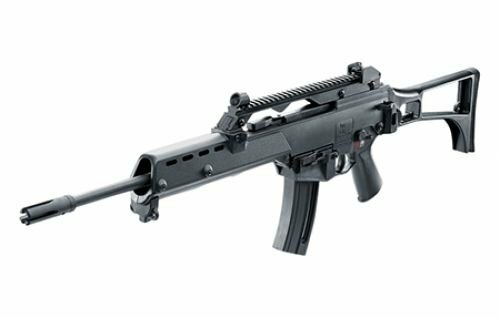 Extensive use of polymers and glass reinforced plastic give a lightweight and strong rifle requiring minimal maintenance. Adopted by many countries the accuracy and ease of use have ensured the G36 is ideally suited to modern combat situations as well as policing and security efforts. There have been a few reports that the G36 fails to maintain accuracy after a prolonged period of rapid fire but investigations are inconclusive. Carried by Alice in "Resident Evil", Tom Cruise in "MI:III", SG1 and the crew of Serenity in "Firefly". Also lovers of the classic Far-Cry game will recognise this from the game, but will notice we haven't attached the grenade launcher! An early incarnation of the M16 series, the A1 was extensively used in VietNam and all over the World. Our version is a close copy of the A1 with a few nods to the A2 version. With its triangular handguards the A1 is easily recognisable in many movies from "Platoon" and "Full Metal Jacket" to "Rambo". 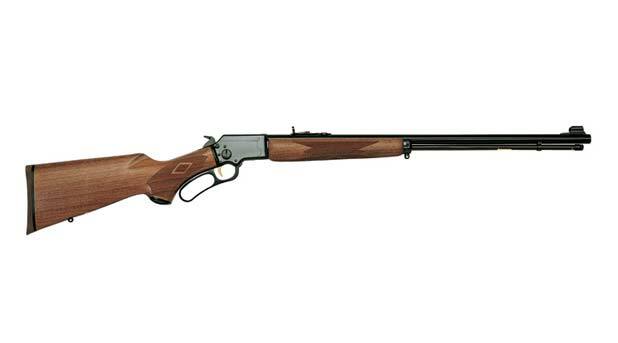 Often referred to as "The Winchester" (maybe because of similarities with the rifle in "Shaun of the Dead"), the Marlin is a lever action rifle design from the 19th century. Similar to a Winchester at a quick glance, the Model 39 was the first lever action rifle to be chambered in 22LR, way back in the 1890's, and has been in continual production for over 100 years. Reliable and capable of fast, accurate fire the underlever is a favourite of zombie hunters the World over as well as famous gun slinger, Annie Oakley. The Marlin39 is capable of being 'broken down' into 2 parts for ease of carry or storage. The AR7 was developed by the designer of the AR15/M16, Eugene Stoner, for ArmaLite in the late '50s, it was designed to give US Airforce airman a small calibre light hunting rifle they could rely upon if they had to leave the aircraft over a remote area and would have to fend for themselves for a while. It is capable of being packed away into its own buttstock (which also floats) and can be stored in a back pack for ease of movement. Small, lightweight and reliable it is still a popular choice for those in need of a firearm but can't afford the extra space and weight of a full-sized carbine. What's included in your experience. *We accept both cash and card on site. On-site Parking is free, and is close to the ranges. What to expect on your experience. Please arrive at least 15 minutes before the start of the experience as there are a few paperwork formalities that need to addressed before the start. An experience can last approximately an hour and a half and the time allotted for sessions is 2 hours, however if the experience finishes with time to spare there will be an opportunity to purchase further ammunition and to have further practice on the target range. If you are running late or are struggling to find the venue please call the mobile number listed on the contact page and let us know as soon as possible. This is an outside event and will take place whatever the weather, safety permitting. Expect to be on the range for the whole time so bring clothing and footwear suitable for the English weather. There will be cover from the rain for those not shooting. We provide the firearms and ammunition which are relevent to the gamer theme of this experience. All safety equipment such as hearing and eye protection for participants is also provided. If heavy rain is expected, the firing points will be covered but if the wind or weather gets too bad, other arrangements may need to be made. Please be aware of the weather forecast on the day and dress appropriately for being outside. No. The rifles fire a small bullet with minimal recoil, using the correct method you will be shown will ensure that even the most delicate person is not hurt by this. The hearing protection is provided and is mandatory when the shooting of un-moderated (non-silenced) firearms is taking place. Eye protection is also provided and is mandatory for shooters and spectators when any shooting is taking place at reactive targets. What targets will I be shooting? We offer a range of targetry to give a fun and balanced experience. There will be zero targets, bulls-eye and silhouette targets to test your accuracy upon, as well as various steel targets to test your speed shooting abilities. 14yrs and over (we can cater for younger participants in most instances with prior notice). Please note that some younger participants who are still awaiting a growth spurt many have difficulties with the standard kit. If you feel this could be an issue call us first and we can work around most problems by issuing slightly different equipment. Under 18s will require an adult to be present to sign the consent form, and the adult must be present during all of the activities. Parking is limited, as is space on the ranges at the venues we use, but a few spectators are allowed to stand behind the range in the safety areas. Hearing protection is not mandatory for spectators but safety glasses are, and spectators will have to provide their own (sunglasses are acceptable). Are there any limitations or restrictions other than age? Shooting is a fun and inclusive sport. Young, old, male, female, and those less able can compete on an equal footing in many shooting disciplines. Most disabilities are not a hindrance to shooting in some form or other. If you feel you may have a problem with access or in some other way please let us know when you book and we are confident we can include you in all but the most extreme cases. The ranges are outdoors and on grass, however they are wheelchair accessible. Please note:- if it has been wet for several days before your event the ground may be soggy so bear this in mind when thinking about access for able and the less able alike. Scores can be viewed on site and targets taken home to display to the envious friends and family. You can see the top 10 scoreboards for our Rifle Shooting Experience (Option 1a) here. We hope you enjoy your time with us and leave us with a smile on your face and a greater appreciation for the shooting sports. Use this form to make a booking for your gamer's experience day! If you are looking to book a different experience, please click here to see the full list. Please ensure you have read the 'What to Expect' section above. Please note: If you are booking with a gift voucher, please ensure that you enter the gift voucher code on the form where it says 'coupon', and bring the voucher with you when you attend the experience day. For more information about gift vouchers, or to order gift vouchers, please visit the 'Vouchers page'. Your browser does not support iFrames. To book, please click here.